Volunteers play a key role in making the History Center one of the finest cultural organizations in the U.S. By donating time and talents, volunteers assist with many facets of the organization. Volunteers with a wide range of skills and expertise are needed at the History Center, Western Pennsylvania Sports Museum, Meadowcroft Rockshelter and Historic Village, and the Fort Pitt Museum. Concierge: Warmly greet patrons upon arrival at the Museum and throughout the building for special events and public programs. 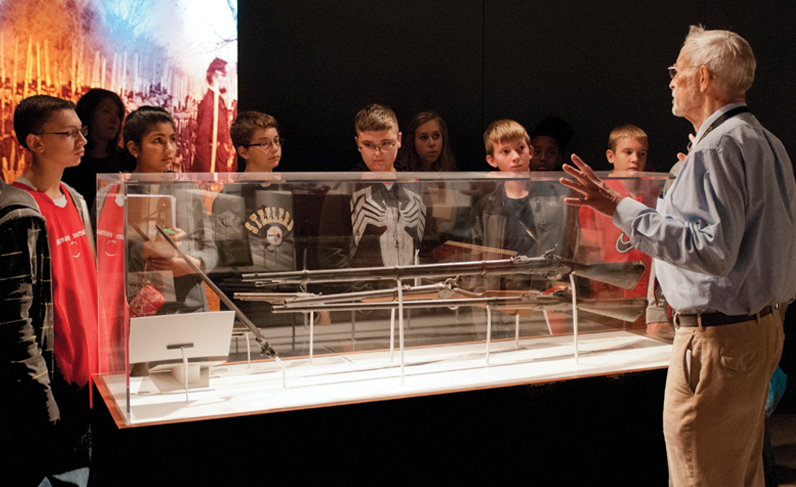 Docent: Become a docent and guide visitors through a thematic exploration of the museum collection and its unique exhibits, engage in storytelling, prompt meaningful conversations, and lead interactive activities with a diverse audience, including students K-12 as well as adults. Ambassador: Develop and deliver a western Pennsylvania history presentation to the community at-large through public speaking outreach. Library & Archives Volunteer: Assist librarians and archivists with a variety of inventorying tasks, digitization, reference desk assistance, and oral history transcriptions. Are you interested in learning how you can help? Please fill out an online application and a History Center staff member will be in touch soon. For additional questions, please contact Ellen DeNinno at 412-454-6412 or ehdeninno@heinzhistorycenter.org. Current History Center volunteers can login to their Volunteer Information Center Network (Vicnet) accounts here.